Ripple Grove Press, 9780991386680, 40pp. Mr. Tanner runs a dry cleaning shop in Dayton, Ohio, where he spends his days greeting his customers with his beautiful baritone voice. His friends and neighbors encourage him to sing professionally instead of cleaning clothes. He eventually takes a chance and travels to New York City to be heard by a concert agent and critics, only to find they weren’t hearing what he was feeling. 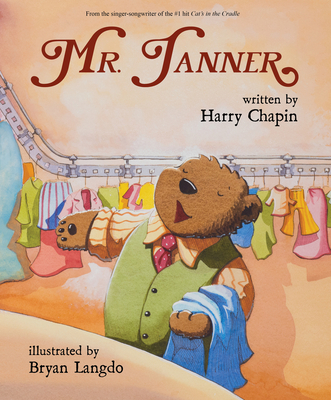 The song Mr. Tanner was released in 1973 off Harry Chapin’s Short Stories album. The song was inspired by a mediocre review about a baritone singer in The New York Times. A portion of the proceeds from the sale of this book will go to help support WhyHunger, a charity championed by Harry Chapin himself. Harry Chapin (1942–1981) was an American singer-songwriter best known for his #1 hit Cat’s in the Cradle. He was a true troubadour of storytelling through his songs. He also was a humanitarian who fought to end world hunger and is one of the founders of WhyHunger. Bryan Langdo is the illustrator of over thirty books for children, including Salad Pie by Wendy BooydeGraaff. He is also a writer and editor. When he’s not in his art studio with some music playing, he likes to be outdoors with his wife and two children.